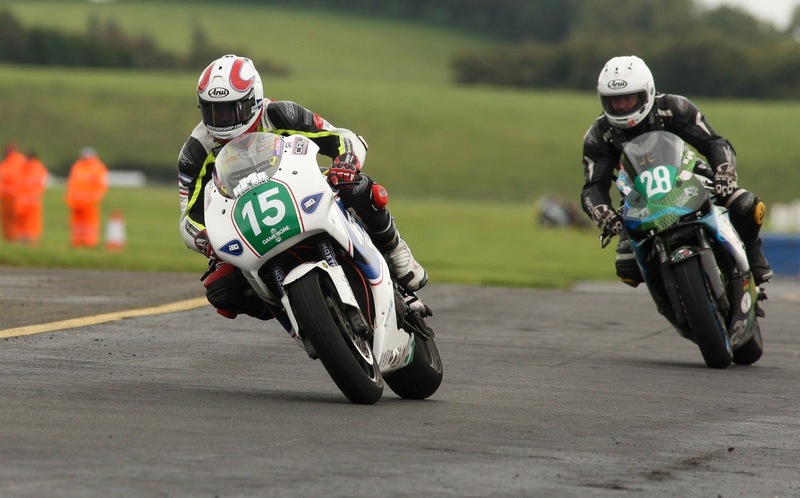 Riders defy damp conditions to produce exciting racing. To days penultimate round of the Irish Superbike Championships took place at St Angelo in mixed conditions. It was a trying day for the new Club, the Enniskillen & District MCC, who were running the meeting for their first time. Despite a rather damp start to the proceedings, the track dried out as the meeting went on, and produced some very exciting racing. Three more championships were decided today, Ballycastles Charles Stuart lifted his first ISB title, a remarkable achievement, in only his third season of racing, Jason Lynn did the double in the 500 class, to take the Irish 600 championship, to add to his Mondello Masters championship, and Rookie, Simon Reid clinching the Irish supertwin championship, at the same circuit where his Father, Brian, began his racing career! Starting from pole position, Reid took both supertwin races, after edging ahead of local rider, Paul Gartland,with James Cotterall in third. 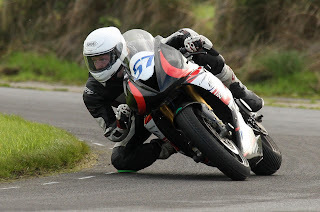 In the stock twins, it was Shane Sweeney who took his first double win, second overall went to rookie, Gary McCoy, with Jonny Singeleton and Christopher Connoly each taking 3rd and 4th placings. Despite gear selection problems in the second pre injection race, Andy Brady dominated both races, Darryl Sharkey saw his championship lead shrink, when he crashed out of race two, after taking second in race one.third in race one, Jonny Irwin could only muster 5th in race two, whilst Dermot Cleary scored his best ever results, exactly one year after starting racing, Cleary was 4th in race one, before improving to 2nd in race two! Evergreen Alan Graham took 3rd in race tow, having finished 5th in race one. Christain Elkin was in a class of his own, taking an undisputed double in the moto three races. Cahal Graham took second in each outing, despite loosing power in race one!. But the biggest cheer went to local lassie, Melissa Kennedy, who was 4th in race one, but took a hard earned third in race two!. 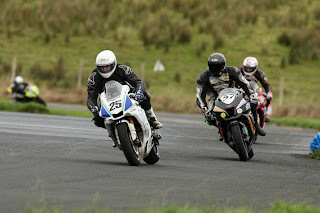 Mark Camblin took over the lead in a hotly contested championship, when he took a double, Rookie Gary McCoy took second in race one, with Enda Treaty doing likewise in race 2.third in each race was championship leader Dean Campbell.Stephen McAdoo and Gary McCoy each had a 4th place finish. Charles Stuart dominated the opening superbike race, to beat Ryan Gibson by over 16 seconds.Mark Glasgow kept his championship hopes alive when he took third spot ahead of James Kelly and local lad Aaron Armstrong. In race two, the race was re started twice, due to a couple of incidents. this time it was Cody Nally, showing form of old, coming from a rather nasty spill at Bishopscourt a few weeks ago, Nally made a wrong tyre choice and had to retire from race one, but in the second outing , along with the fastest lap of the day at 59.921, Nally took the win by 5 seconds from Stuart, with Ryan Gibson, continuing to impress in third place. Mark Glasgow lost his challenge for the 2017 ISB title when he crashed out, thankfully without injury, thus leaving Charles Stuart to clinch the series. This is indeed a remarkable run for the ballycastle rider, who is only in his third season of circuit racing. The former endure rider began racing three years ago in the Formula One class, on board his Aprillia, he took the championship in his first season, last year, he moved to the ISB cup class on board a 1000 Suzuki, and took his second championships in as many seasons, and now, the ISB championship!. Korie McCreevey took the win in the opening 600 race from Champion elect Jason Lynn, but was a retirement in the second race. Lynn snatched second place at the final corner, demoting hotshot Eunan McGlinchey to third, but well clear of Ross Patterson, who had held second spot until suffering from brake problems. In race two ,McGlinchey held the lead until half distance when slow starting Jason Lynn edged ahead to take the win by 3.7 seconds from Ross Patterson, who nipped ahead of McGlinchy at the final bend!. Aaron Armstrong and Darren Keys both put in creditable performances to finish on the leaderboard. Looking over the other classes, John McAlister took a double in the 250 class, with Kevin Lavery a double 600 cup race winner. Chris Campbell dominated the F1 class, whilst Brendan Glover was a double winner in the young guns class, with Cameron Dawson in second spot each time. Paul Demaine was a double Superbike cup race winner whilst Sam Laffins, taking time out from his KTM championship exploits, snatched a last lap victory from race one winner, Jonny Campbell and Andrew Smyth..
Due to an incident on the start line in race two, the classic competitors only got one race. Barry Davison topped the 250 class form Brian Mateer and Nigel Moore, Linton Irwin was best of the 350 runners well clear of second man, Nicky Lamb and Freddie Stewart. Alex Conroy was the best of the 500 brigade with David Carleton in second spot ahead of Billy Lyle, with Robert McCrum the best of the 1000 runners. Despite the conditions to day, there was one new lap record set!, Gareth Keys set a new lap record for the Forgotten Era class on his beautiful sounding 350 yamaha.. Earlier in the week, the Enniskillen and District MCC announced, that they had been given the green light for a new proposed road race in 2018, lets hope that this new club achieves their goal. Thanks to all The Medics, Marshalls, Officials, Spectators and not forgetting the competitors, for yet another exciting race meeting at St Angeleo. #57,Korie McCreevey, First 600 race winner. #25 Charles Stuart, 2017 ISB Champion.